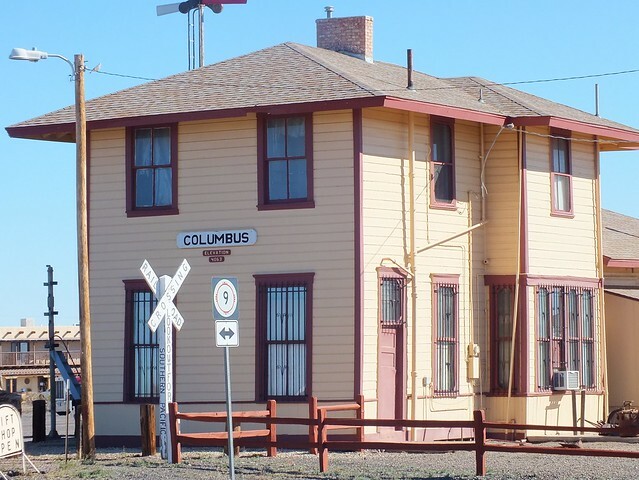 Gila Bend looked like an ordinary 'Crossroads town' but now we were here it was time to find out a little about it. 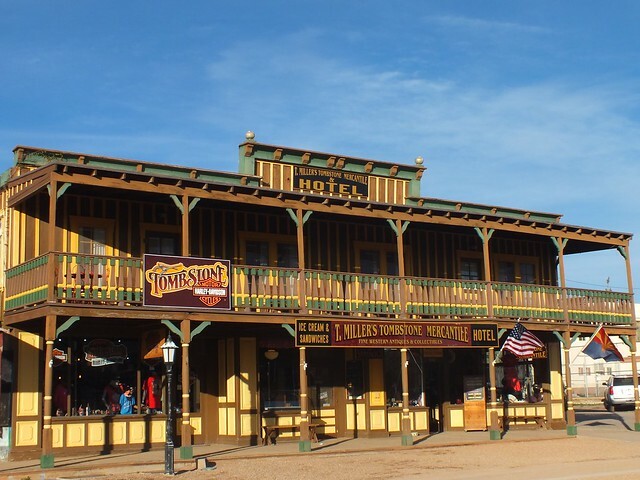 It has some interesting history in being a resting place for weary travellers heading west in the pioneering days and was a timed stop along the Butterfield overland stagecoach route. 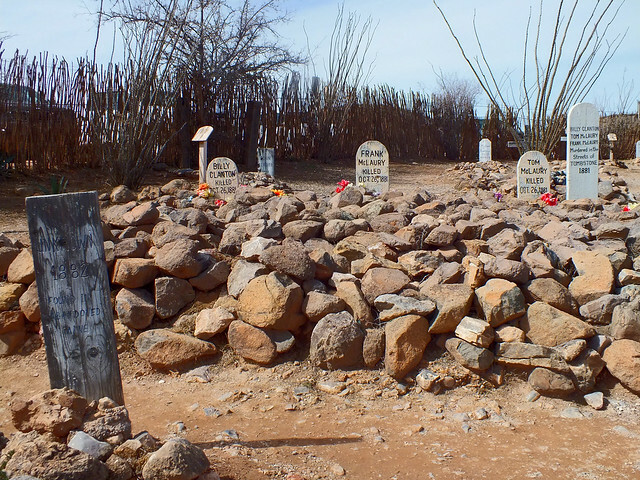 The Gila station was burned down by Apache before being rebuilt and it was also the area Olive Oatman and her sister were captured by Indians after they had massacred their family. Oatman AZ was apparently named in her honour. It's recent claim to fame is being home to Prince Harry while he was training at the local Gila Bend Air Force Auxilliary Field. Around this small, average looking town is a huge solar power plant, the 2nd largest natural gas plant in the Nation ($1.2 billion dollar installation) and a 50 million dollar Paper mill. 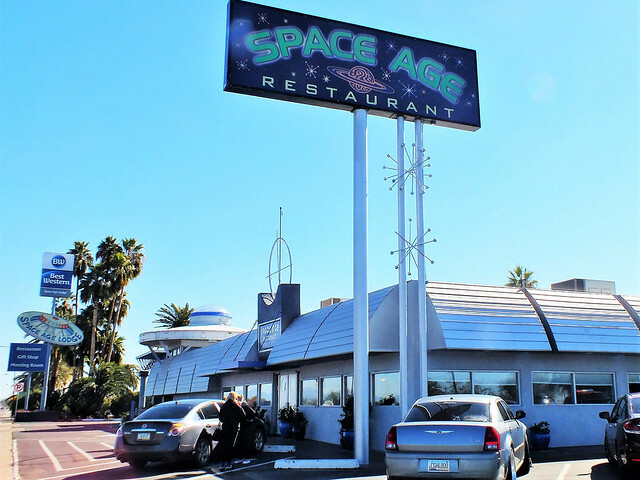 In town there is the 'Space age' restaurant where we decided to go and have a breakfast. It's pretty quirky and the food was decent enough. The car park wasn't huge so we parked out back by the railway line. 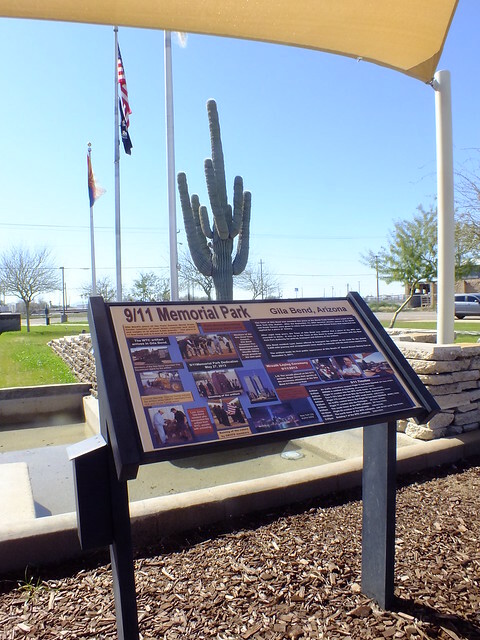 I had read about a 9/11 Memorial park so we strolled down the street to take a look. It was small, but had a BIG impact. 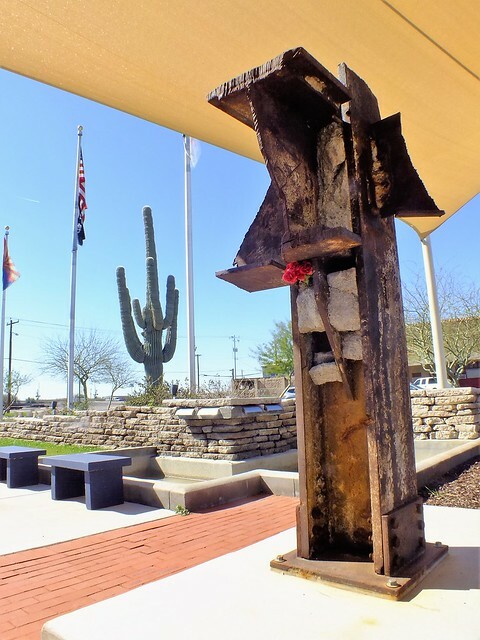 A nice little garden with a water feature, a giant cactus, flags and a steel girder recovered from the site of the Twin towers certainly make it a nice spot to reflect and remember. The town hold a service each year as a mark of respect to those lives lost. 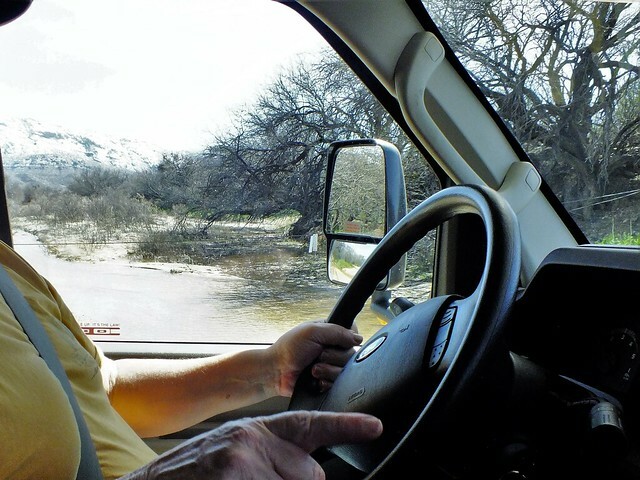 We made our way back to the RV and was soon back on the road heading towards Tucson for our dinner date with Buck and Debbie that we were both looking forward to. We could of taken a straight shot along I-8 to 1-10, but those that know me know that's not going to happen. 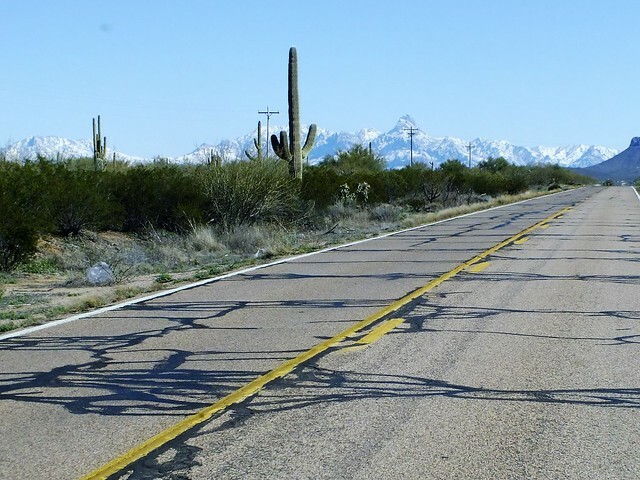 We prefer the Highways and Byways so we headed south on AZ85 through Ajo and headed east at Why on AZ86. 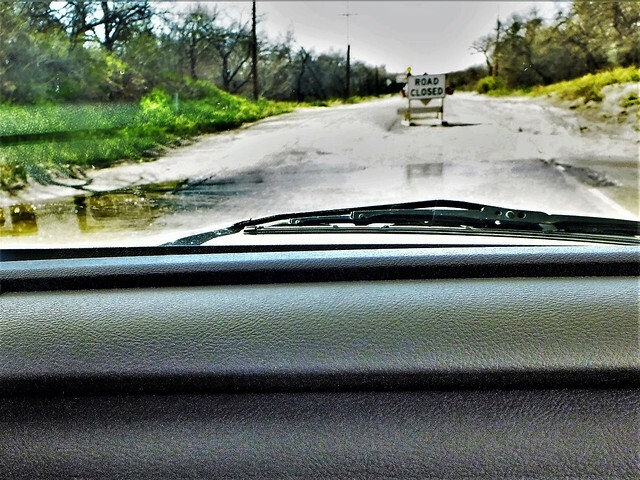 We started to see Billboards advertising Mexican insurance and many more Border patrol vehicles along this stretch. The cactus were getting more dense and bigger and with a couple of horses running across the road it gave us a real taste of the 'Wild west'. We pulled off the road to stretch the legs and take in the views at a historic marker pull out. 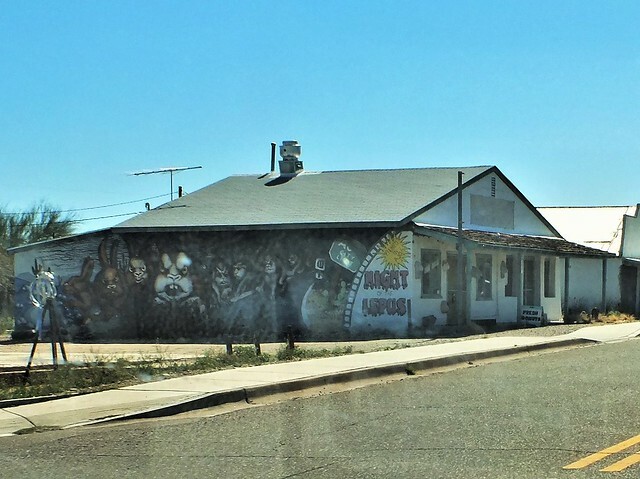 The sign told us about Quijotoa, a site where deposits of gold and silver were discovered created a development boom, suburbs known as Logan City, New Virginia, Brooklyn and Allen city were built. The site was a complete failure and was left abandoned and now there is no sign of it ever being there as the desert reclaimed the land over time. We were walking along a wire fence (which I presumed was a ranch boundary as we were probably 20 miles from the Mexican border) taking photos and looking at the views for a little while before heading back to the RV and putting the kettle on. Sat down drinking our coffee 5 minutes later and a 4WD Border patrol vehicle was slowly edging through the rough terrain on the other side of the fence. Not sure if this was a coincidence or not, or if we had been detected as suspicious activity in a remote area somehow. There were quite a few check points along the border area, where we stopped and answered a couple of questions and showed our passports before being sent on our way. We continued on our way enjoying the views of cactus covered hills with snow covered mountains in the background, including Kit Peak and Observatory. 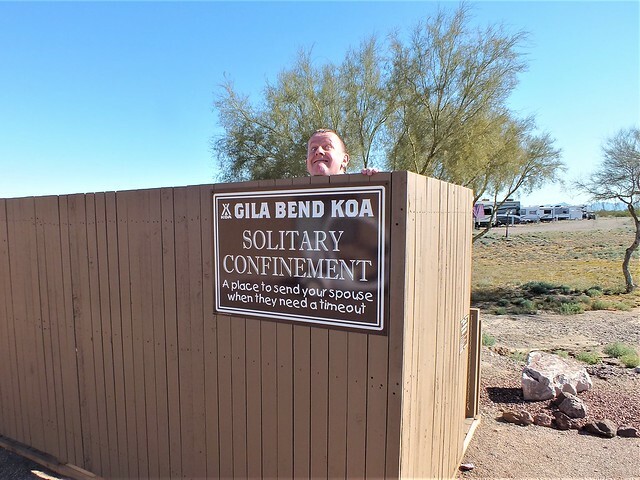 We rolled into Tucson about 4:30pm and found our RV site, Lazyday's KOA resort. We had looked and enquired at other places, but as it's a popular time for the 'Snowbirds' who usually stay for longer periods of time, they would not take a booking for a single night. 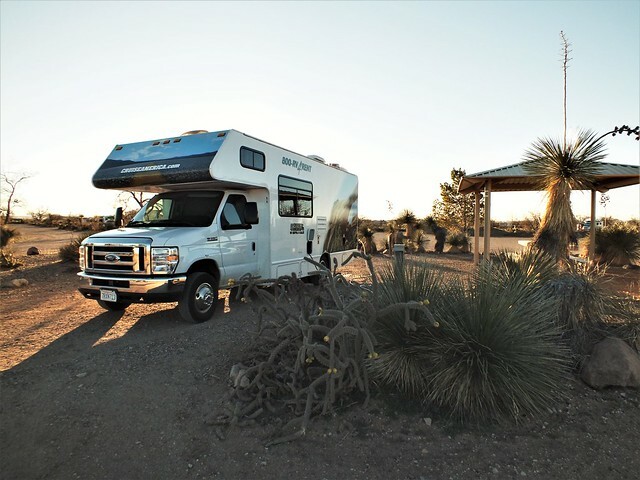 Lazyday's is a huge place that also has an RV sales and service centre which is a little confusing as the entrance to the RV park is quite small and in a different road. We got there in the end, only to discover the weather had been playing them havoc and they had suffered a complete loss of power to the site and some huge generators were on there way by road from the Phoenix area. I called Buck to let him know we were in town and he kindly offered to pick us up and drop us back after dinner. Although we communicate occasionally through RTA, we have only had chance to meet once before when Buck visited the UK back in 2015 (I think) so I was looking forward to catching up IRL. It wasn't long before we were picked up and on our way to a lovely Mexican restaurant called 'Mi Nidito's', it's claim to fame being that Bill Clinton had eaten there. It's popularity meant there was a bit of a wait for a table, but it gave us time to catch up and have a chat. 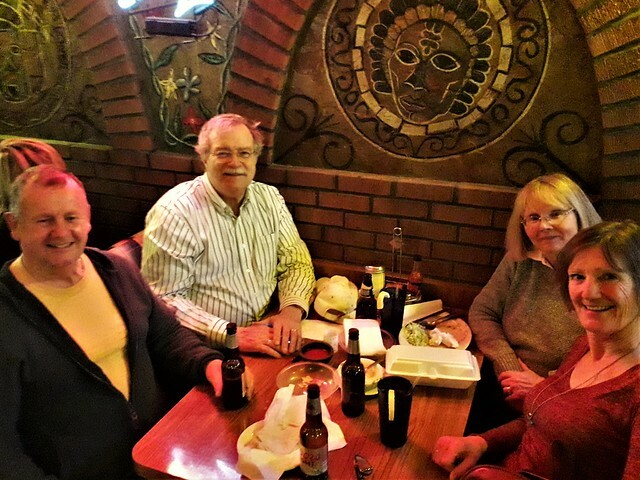 The food and atmosphere was great and the company was even better, we had a wonderful evening and the conversation flowed. (Buck and Debby helped us work through the menu, as our knowledge of Mexican food is limited) It was a shame we didn't have more time to spare this trip, but with many great things to see and do around the Tucson area, we hope to be back one day and arrange another get together. Todays mileage:185 miles. Total: 1101 miles. Boy, that KOA is in a whole different area than my parents' KOA was, back in the 1970's! 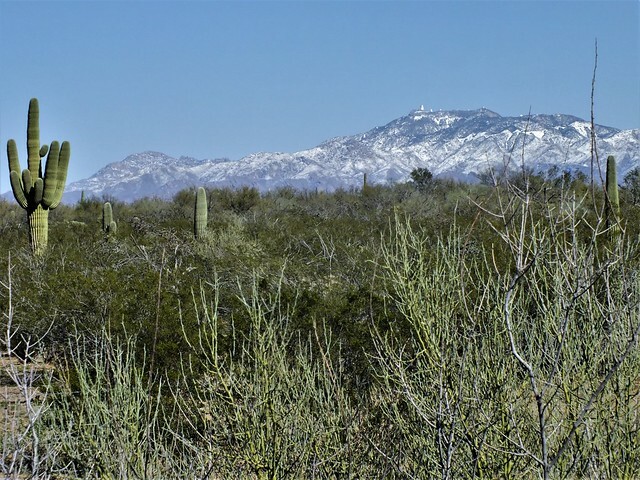 Tucson KOA was located out between Cortaro Road and Avra Valley Road, on the south side of I-10. I believe the site is now located underneath the Twin Peaks Road exit ramp from the eastbound lanes. 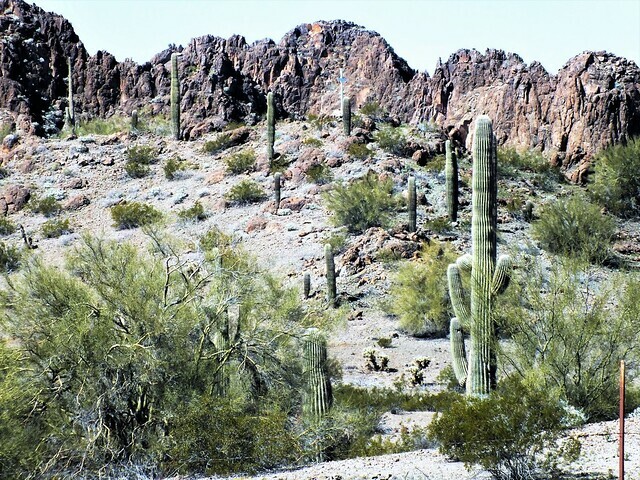 The Lazyday's site is on the other side of Tucson. Wow. We rarely use an alarm clock as one of us usually wakes between 7 and 8am, but today we had both slept in and I was shocked when I looked at the clock only to discover it had just gone 9:40am. I guess the days had caught up with us a little. We didn't rush, we just slowly got ready and had some breakfast while deciding what to do for the day ahead. I had made a note of plenty of options, Saguaro west, Saguaro east, Mt Lemmon, Sabino Canyon, the Airplane Boneyard plus much, much more. 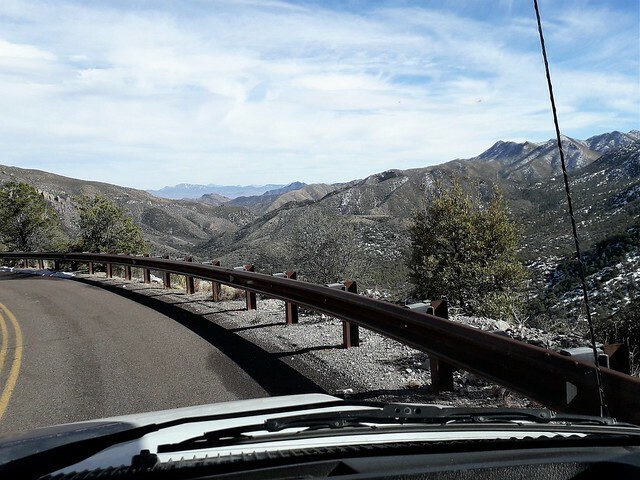 I had been looking forward to driving up Mt Lemmon, these types of drives are the ones I love, but I already knew it would be too risky in the RV after the recent snow and Buck had all but confirmed it wasn't going to be so good up there. Lezli isn't much of a shopper and like me enjoys the outdoors, but there are some things she likes to buy that she can't get (or are too expensive) at home, so first stop was the Park Place shopping Mall. 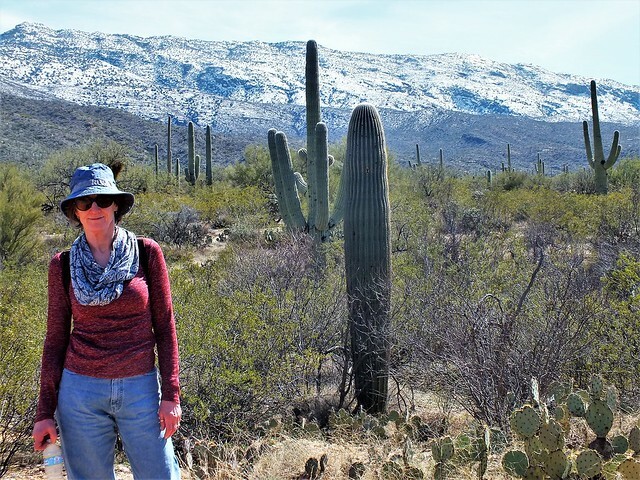 She had no joy in finding what she wanted so we headed to Saguaro East NP, but as it was a warm, sunny Sunday we decided to go to a quieter area to the Northeast of the Visitor centre and the Cactus Forest drive to the Douglas Spring Trailhead near Tanque Verde Ranch. As we were driving along E. Speedway Blvd we came across some water on the road and apparently there was a road closed sign but I didn't see it (cough cough) and continued on. It turned out I wasn't the only one who headed to the Trailhead, the parking lot was full and vehicles were parked along either side of the road. I parked up to the back of those on the road unsure of what turning room I might have ahead as it's a no through road. The road wasn't that wide but with a little extra room either side of the road surface I thought it wise to turn the RV around before going for our walk, as I wouldn't have that option when more cars turned up and parked behind and opposite. Turned out to be a good choice ! 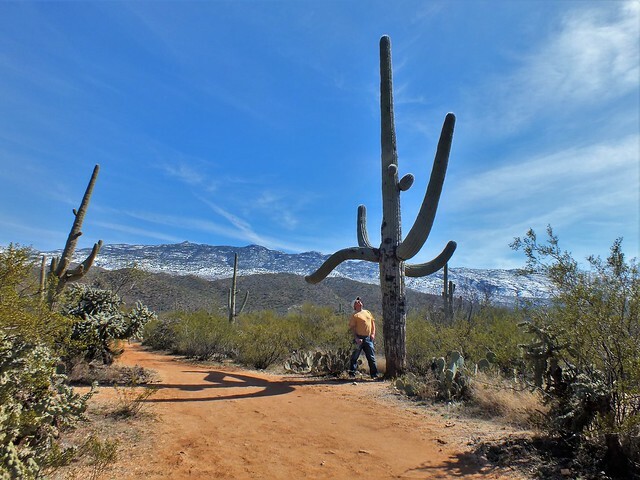 The walk was lovely and despite the number of vehicles, the Trail felt relatively quiet and secluded and we enjoyed strolling through the various cactus plants while enjoying the views. There were some Big boys! After our walk we decided to start making our way down to our next overnight stop, rather than rush around trying to see more than we can manage. Besides, we will look forward to seeing Buck and Debby again sometime in the future and I know that Mt Lemmon will be an 'itch I just need to scratch', so we will be back one day. 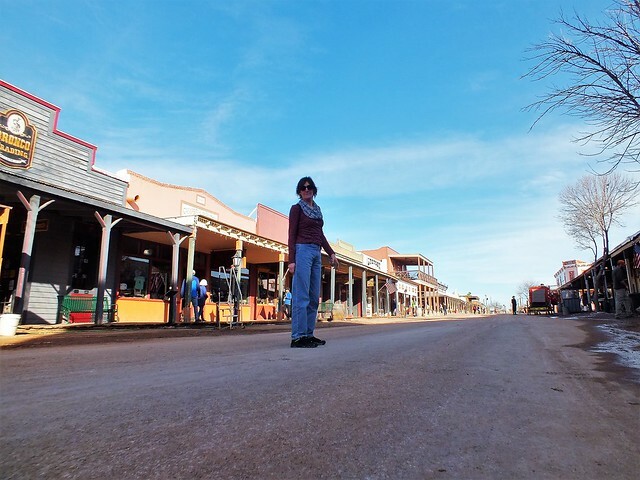 So it was off to Tombstone ! We headed back to I-10 after taking a small detour that took us down a perimeter of the Airplane Boneyard on the way (Boy that's a lot of Planes!) 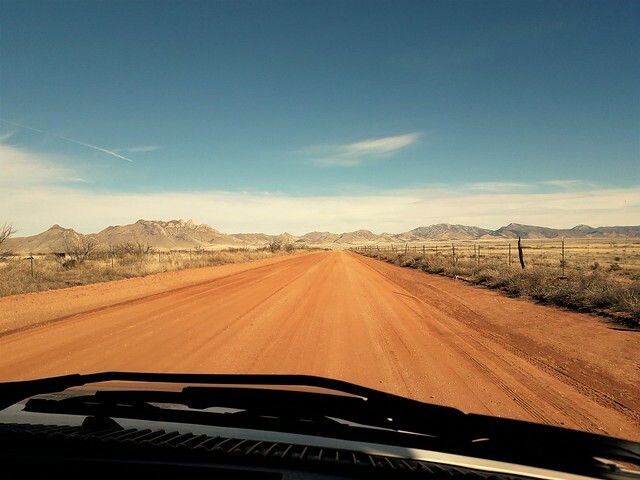 and then from I-10 we headed south on AZ80 straight into Tombstone. The Wells Fargo RV park is right on the corner of town and on arrival we stepped out of the RV to the sound of shouting and loud gunfire. None of the Locals seemed bothered so we took that to mean it was one of the Gunfight shows taking place ! Once checked in and settled we decided to walk into town, Yep it was Touristy as we had expected, but it was also kinda cool to experience. Lezli preparing to clean up those mean streets. We wanted to go back to the RV to freshen up before eating in 'Big Nose Kates Saloon'. It was packed in there so we enquired about booking a table in an hour or so's time only to be told they don't take bookings. They did say they would find us a table though and it would likely be quieter by then. When we went back we practically had the place to ourselves other than the Staff and a few Locals who were finishing work. 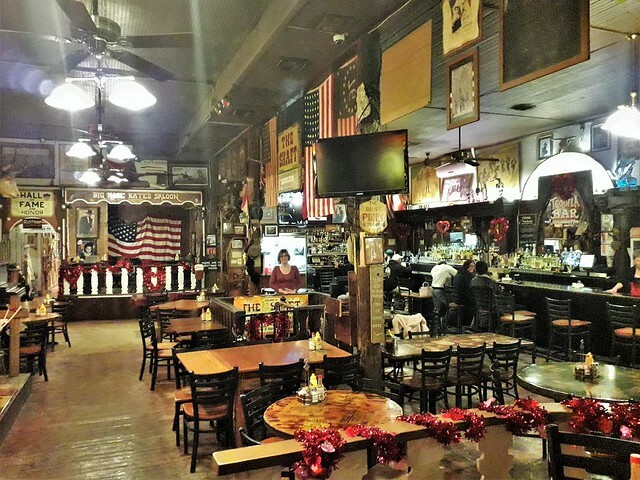 It was an amazing place, the staff were in costume and the walls and timbers were full of memorabilia, the beer was cold and the food was tasty ! Touristy ? Hell yeah but it was a lot of fun ! It was like the Tardis, looking so much bigger on the inside. We strolled back through town in the dark, it was like a ghost town apart from the odd footstep heard from the shadows of the boardwalks. It must of been unnerving 'back in the day'. We had a nightcap and then it was to bed as we have a few miles to cover tomorrow. Today's mileage: 91 miles. Total: 1192. Cowboys, Indians and Mexican bandits ! After our relatively relaxed day yesterday we are up at 7am this morning looking forward to the day ahead. After a coffee we get showered and walk around the corner to the O.K. Cafe and have a fabulous breakfast and a laugh and joke with the Locals. We then head into town to look around a couple of stores and buy a couple of T shirts. 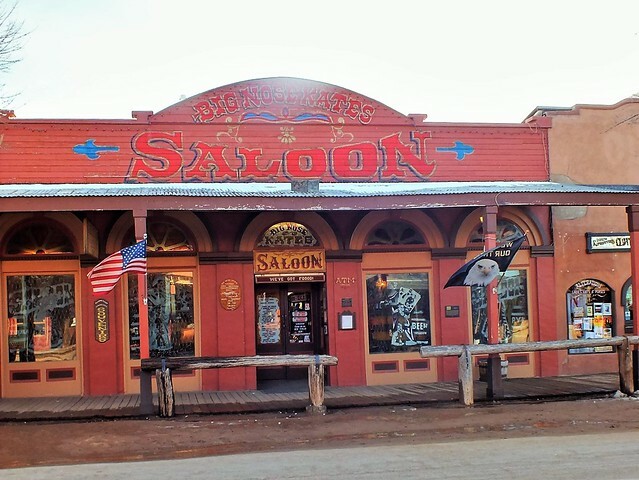 We had enjoyed Tombstone and it's interesting buildings, the Old Courthouse, the Birdcage Theatre, Big Nose Kates saloon and the Fallen Angel sweet sin Parlour. which isn't what you might think !! The Sin Parlour sells naughty delights such as ice cream and fudge. (Yes Keithg we sampled them, lots of lovely flavours !) Although it's touristy it is still a working, living town with much to offer. Back at the RV park we disconnected the electric and water and took a short drive up the road to a 'Circle K' for fuel and supplies. 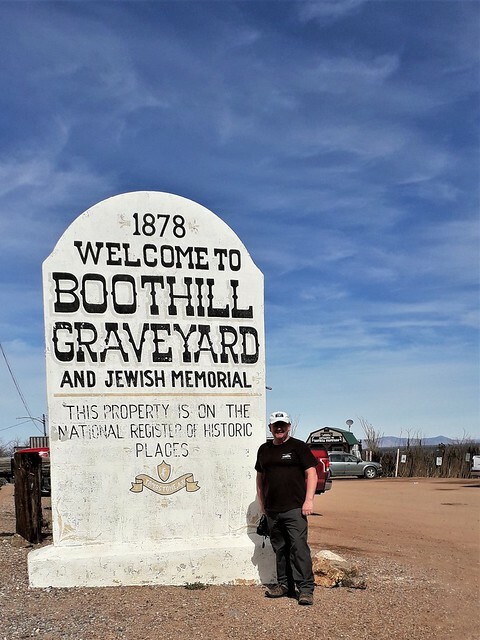 This was close to Boothill Graveyard so I asked for permission to leave the RV parked up there while we walked up the hill to take a look. Outside was a rusting hearse with bones inside it and messages written on it such as' "Why walk around half dead when we can bury you for $49:50" I'll pass on today's special offer I think. At $3 per person entry fee we decided to have a quick walk around the graveyard. The lady at the desk gave us a leaflet and marked the graves of some significance while telling us some stories, she was really pleasant and most helpful. She pointed out one grave for Lester Moore who's grave read '4 slugs from a 44. No Les no more.' It's more famously known for being the final resting place to the victims of the shoot out at the OK Coral. 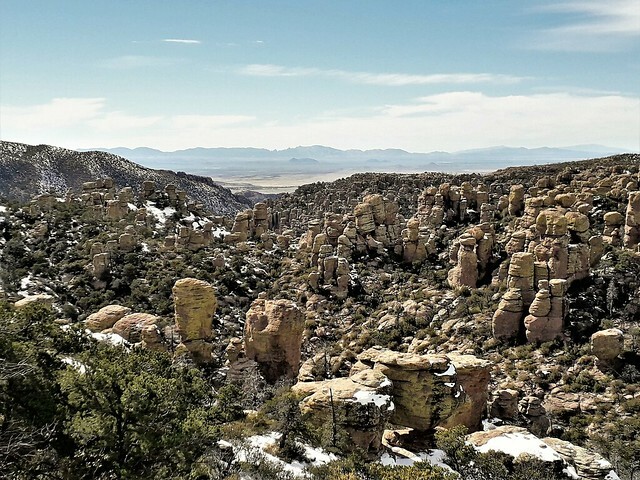 It was time to hit the road and make our way to Chiricahua National Monument, heading south out of town and along Davis road to McNeal and north on US 191 to AZ181 through Sunizona. 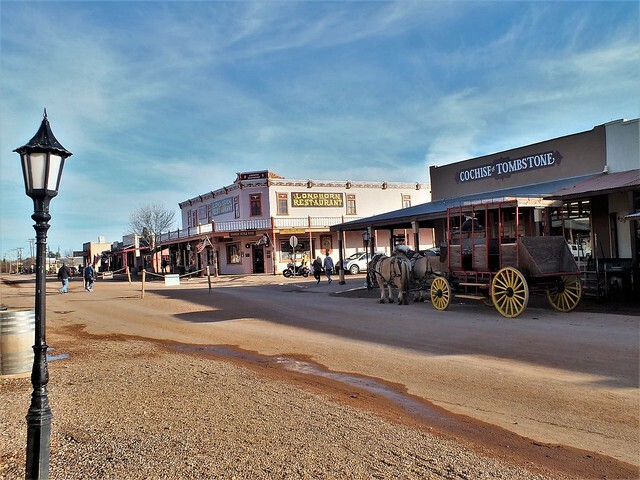 Before arriving at the Monument we had considered detouring along Turkey creek road to look at the resting place of Johnny Ringo, a notorious figure in, and around Tombstone, but as his grave site is a little way out and on private land we decided to carry on past. 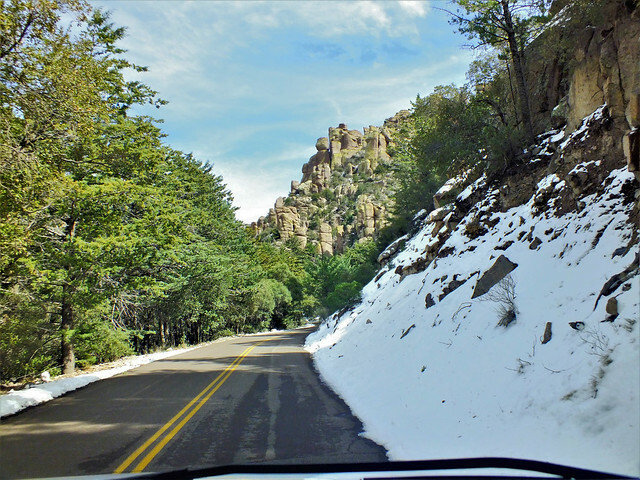 We could see snow on top of the Chiricahua mountains and as we got closer there was snow on either side of the road, the scenery was very pretty. We pulled into the visitor centre to have a quick look and to purchase our Annual pass that we still hadn't done. No luck, it's a free park and so doesn't sell passes. 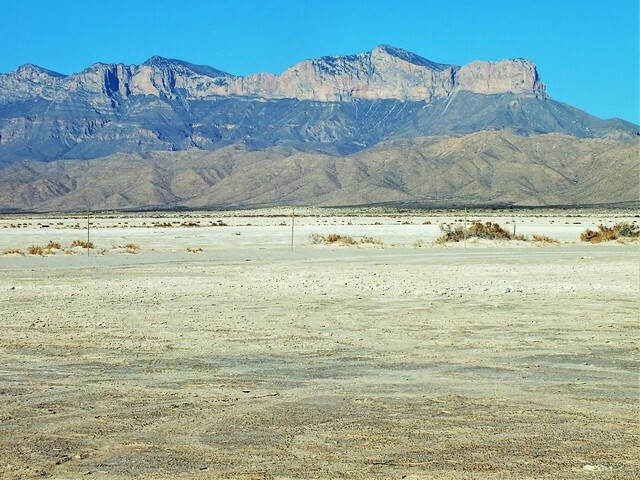 With the snow on the ground I thought I would check to see if they may have any information as to the condition of the unmade Apache Pass road that goes to Fort Bowie. They hadn't heard any horror stories but said it's likely to be soft and slick in places due to rain and snow melt and then asked what we were driving. When I replied "an RV" they said perhaps I should give it a miss or go the long way around via Wilcox and the town of Bowie. That would of added 50 miles and an hour or more to our day, time we didn't have to spare. 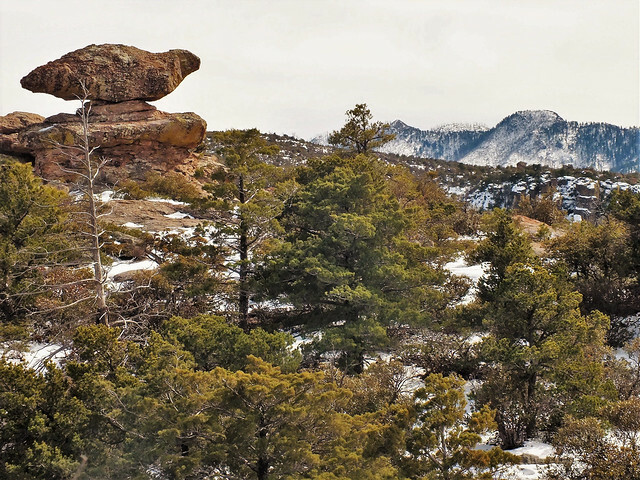 Anyway, we headed up Bonita Canyon to some beautiful and dramatic scenery of rock columns and balanced rocks among the snowy, forested valleys. 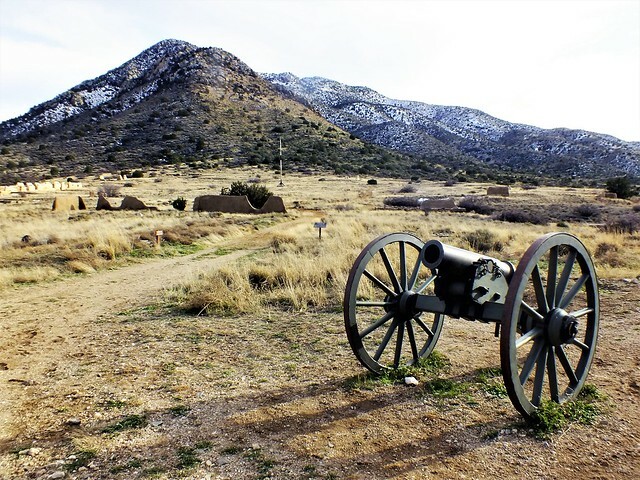 The fact it is steeped in American west history connected to the Apache wars, where warriors such as Cochise and Geronimo roamed and fought, made it even more fascinating. The road was fun to drive, it was quite twisty and narrow in places with a length restriction that wouldn't of allowed access had we chosen the larger RV. We stopped at Echo point before continuing to the end of the road and walking around the Massai Point trail. One last question I had asked in the visitor centre was "Do you think Apache Pass road would of been OK if we were in a normal sedan?" The answer was "Yes, we think so". That was good enough for me so we headed back down the canyon and towards Fort Bowie. 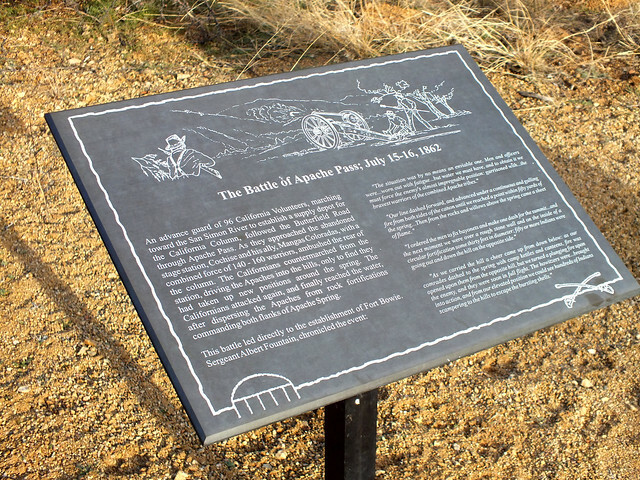 Apache Pass road to Fort Bowie. Going to have to finish this days tale later. Last edited by Southwest Dave; 04-10-2019 at 01:08 AM. Great to see you didn't miss the chance of tasting there ice cream :-) . We are loving your report. 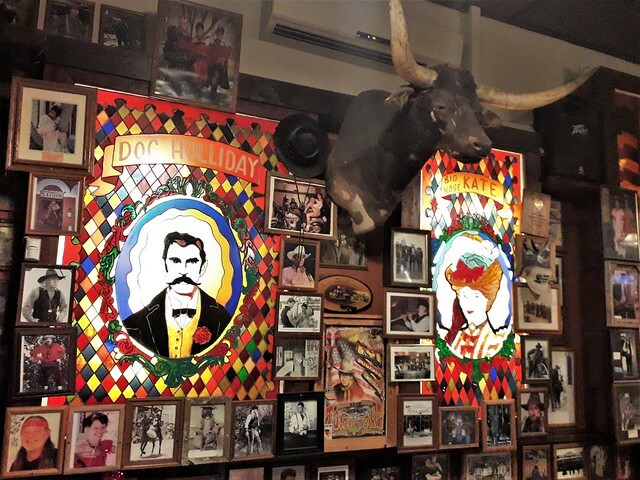 Real cowboy area. Certainly giving us a lot of ideas for the future. So much to see. So little time. Great photo's as well. Looking forward to the rest of trip. Also, Happy Birthday for today. I want to be a cowboy when I grow up ! Fort Bowie to Pancho Villa State park. 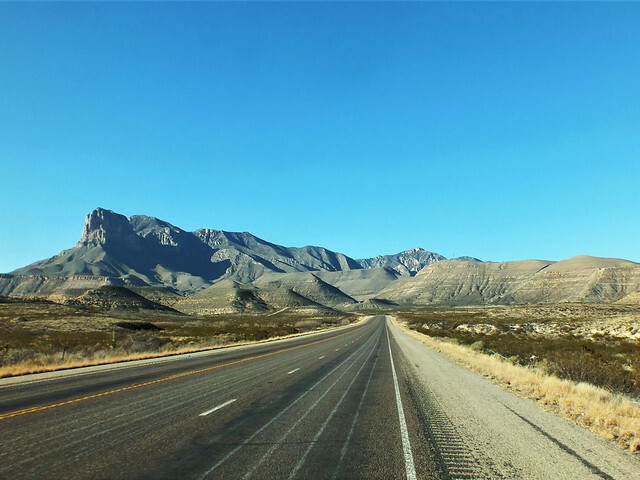 The Apache pass road to Fort Bowie was a bit slick on top but generally in good shape. As we got nearer the Fort parking area the road got a bit narrower and twisty, with some dips that contained water deeper than you may think, turning the road surface underneath a bit mushy, but not a problem with a bit of commitment driving through. To get to the Fort you have to tackle a 3 mile round hike but it's quite an easy one, at least at this time of year. I would imagine the heat of the summer may make it more challenging. It was 4pm on arrival so we kept up quite a brisk pace hoping to catch the visitor centre open but it was closed by the time we got there. I didn't realise it closes at 4:15pm, or else we could of taken it easier knowing it would of been impossible to make it. (We had wanted to purchase our Annual parks pass and Lezli wanted to collect a National park pin badge for the 3 mile hike.) We sat on the timber porch of the visitor centre and took in the views of the mountains and Fort remains that are spread over a large area. We were the only people there and you could of heard a pin drop ! 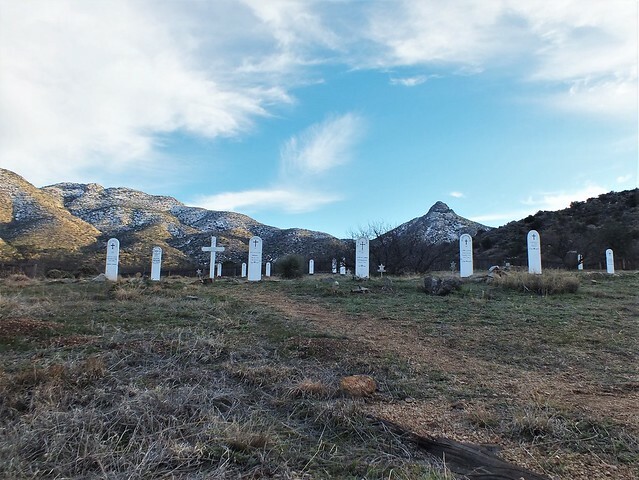 The Fort cemetery was actually created before the Fort and has been restored by the National park service having been damaged by time and cattle grazing around the grounds and grave markers. One of the headboards is marked 'Little Robe. 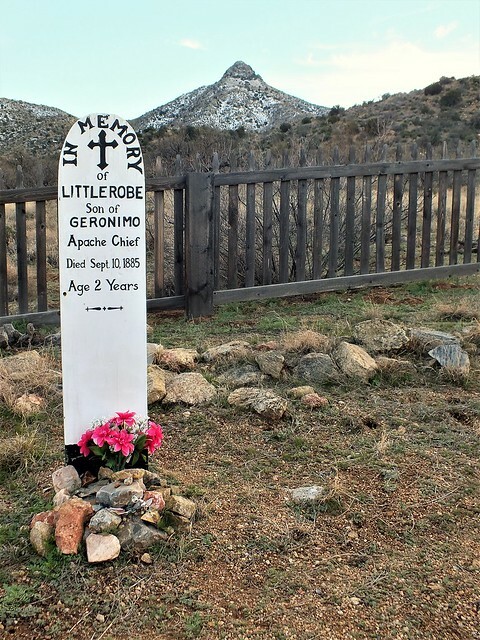 Son of Geronimo' who died at the age of 2 years from (suspected) dysentery. The soldiers were said to love the little fella running around the Fort (after part of a tribe including woman and children were captured) and buried him there after his passing. 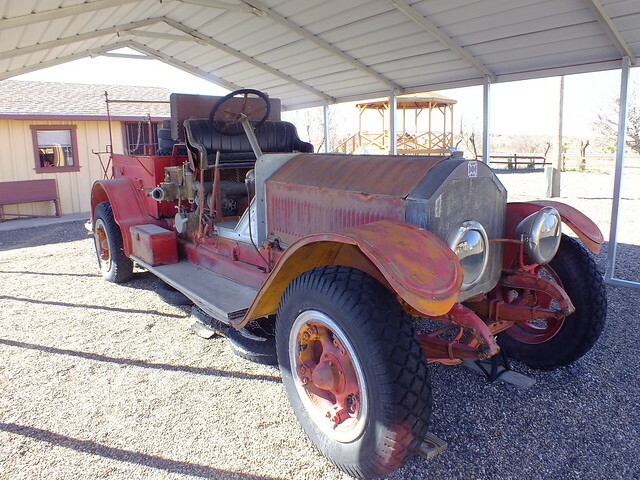 We passed acres and acres of Pistachio trees before arriving at Bowie where we got onto I-10 and 'hot tailed' it to Deming, we then exited I-10 and headed south to Columbus NM and Pancho Villa State park. We arrived around 8:30pm to a night sky that was ablaze with stars. We sat outside with a nice bowl of soup and bread and admired the scene, washed it down with a nice smoothing brandy before turning in for the night. Twas a good day ! Today's mileage: 270 miles. Total: 1462 miles. Last edited by Southwest Dave; 04-14-2019 at 12:50 PM. [B]...the road got a bit narrower and twisty, with some dips that contained water deeper than you may think, turning the road surface underneath a bit mushy, but not a problem with a bit of commitment driving through. Yeah, I bet. 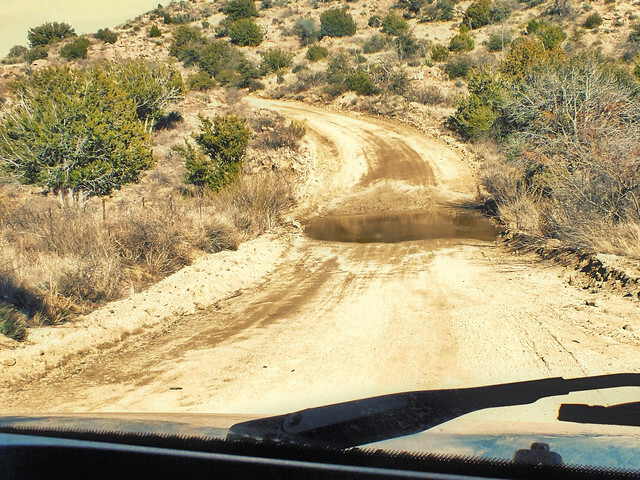 Not sure I would have been quite so thrilled to cross that dip with the RV Rental..
Yeah, 4WD would of been nice! Although the road doesn't look too bad in the pictures it was pulling us about a bit in some parts what with the overhang at the back. We could of done with 'Phoenix one.' I'm still not sure if Lezli would of been too thrilled though, she did have her eyes shut! I didn't go at it 'Gung ho' though, I weighed it all up from experience and felt it was OK to proceed. Texas here we come ! We woke to a glorious morning in Pancho Villa State park which is located in the New Mexico town of Columbus. Camp Furlong (a US army camp) and Columbus was raided by a Mexican revolutionary (Guerrilla leader) called Francisco "Pancho" Villa in 1916, which happened to be the first time an armed invasion of the USA had happened since 1812. Troops were sent to protect the area and hunt him down, but never succeeded in doing so despite lots of men and raids into Mexico. So the park was named after him and there is much info on the history of his life and times in the old customs house, a surviving building from the raid which is now the visitor centre. 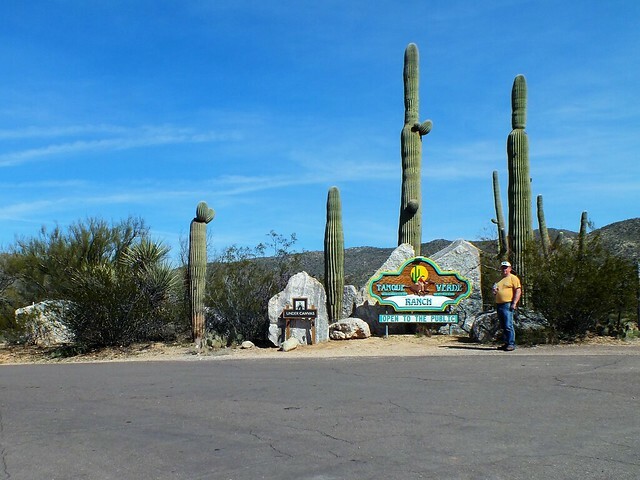 The RV park is very spacious and has generous sized sites with cactus garden and a large shelter with tables and benches. We sat outside and ate breakfast before walking around the site and over the road to the old customs house. We walked up Cootes hill which was used as a lookout post for the soldiers of Camp Furlong. 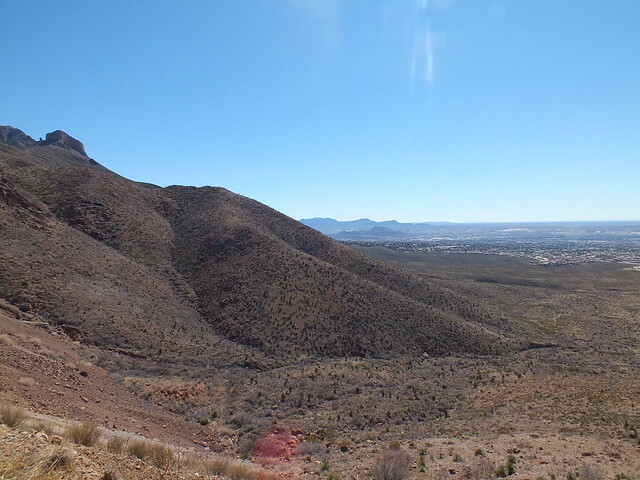 To the south you could clearly see the Mexican town of Puerta Palomas with good all round views. It was very quiet and relaxing, but it was time to get on the road. Our first port of call was the 'Outlet Shoppes' of El Paso which was mainly to look for a new pair of hiking boots in the North Face store for my birthday in a few weeks time. Now I already knew this was a straight forward drive along NM9, but I entered the physical address of the store into the SatNav for convenience when we got near town. The SatNav was directing me north to Deming and through Las Cruces on I-10. Had I relied solely on the SatNav (another reason I never do!) it would of added an extra 50 miles to a 70 mile journey and claimed to save 2 minutes doing so. Moral of the story. Don't ever trust your SatNav ! The Outlets was a large complex and we ended up staying longer than expected looking around various stores, the weather was really heating up so it was time to sound the retreat and get back in the RV. 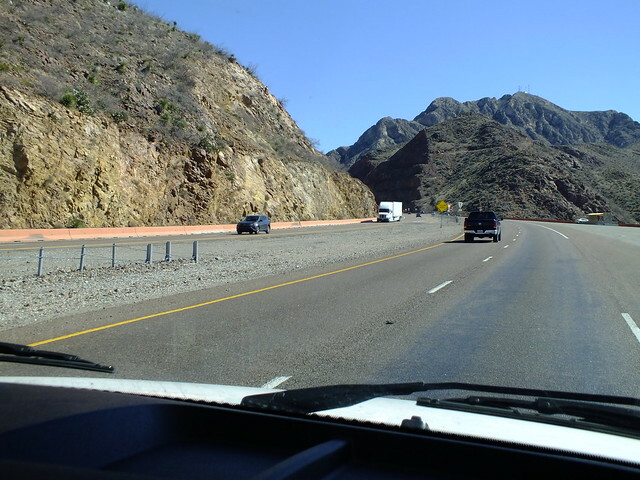 We drove across the top of El Paso on the Woodrow Bean Trans-mountain drive through the Franklin mountains, a fantastic city bypass ! We pulled into a rest area and had a light lunch before continuing through Texas towards the Guadalupe mountains. 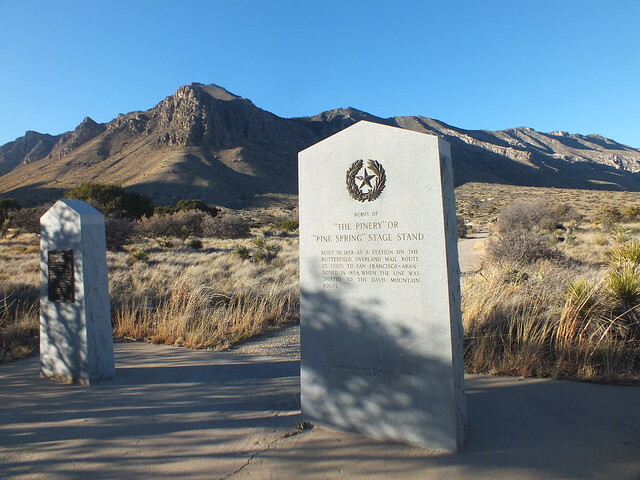 After lunch we made good progress on TX375 to US180 on route to the Pine Springs visitor centre in Guadalupe mountains National park. The closer we got the better the scenery became, with Texas's very own 'El Capitan' dominating the skyline. We first stopped at the Guadalupe Salt Lakes, yet another historic place of unrest. The Salt wars broke out in 1877 over control of the Salt lakes which resulted in lives and property being destroyed. 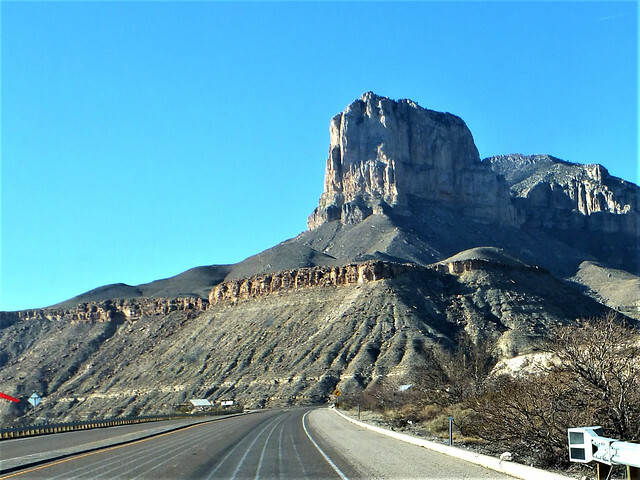 El Capitan heading east on US180. We arrived at Pine Springs visitor centre just as it was closing but they kindly let us in and (finally) we managed to purchase our National parks pass. We had a lovely stroll around the Pinery Trail that led to the Pine Springs Stage stop, another one along the historic Butterfield overland Mail route between St Louis and San Francisco. We didn't have an RV site booked for the night, but the plan was to get to Van Horn TX for the night. 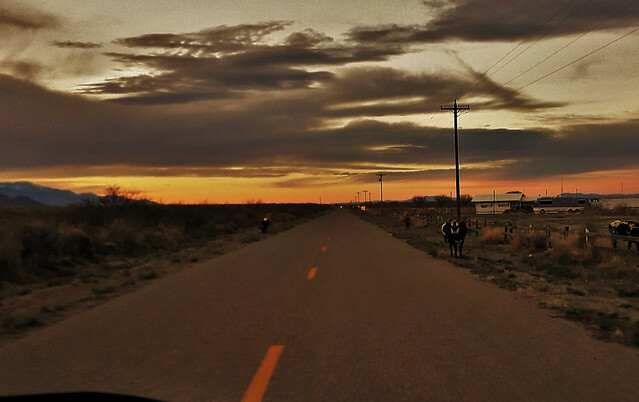 We headed back on ourselves a short way before heading south on TX54 as the sun was beginning to set. 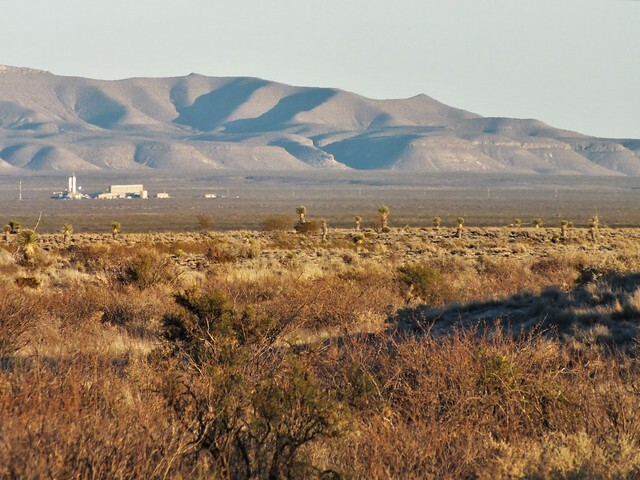 I wasn't hopeful of seeing anything, but I had discovered that there was a sub orbital launch pad about 4 miles off the Highway in a secluded area that wasn't easy to reach. With the sunlight just about right I spotted the launch site with a rocket in situation and pulled over to try and get a picture, it wasn't easy without my tripod to hand and the light dropping quickly, but I managed one that wasn't too shaky. The privately funded 'Blue Origin' company are trying to make space travel more affordable and available to people who could afford such a venture and have been testing rockets that can be used time and time again by launching and re-landing them in tact. They have been transporting payloads to space for NASA and most of the billion dollar funding comes from Jeff Bezos, founder, Chairman and CEO of Amazon. The Blue Shepard (named after Alan Shepard the first American in space) has done a few tests with soft landings and apparently they hope to take their first passengers into space and back during 2019. 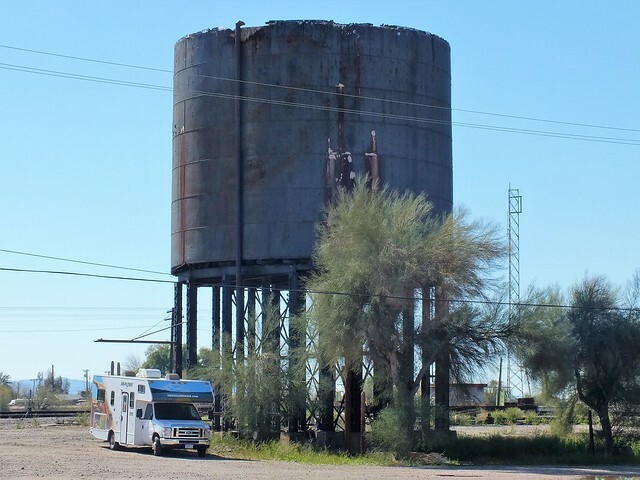 We arrived in Van Horn and found the RV park I had looked up to be fully booked, probably the reason they had not bothered replying to my message sent early this morning ! Our second attempt was successful, the Willow RV park had just 2 vacancies so we took one of them and as I was plugging into the electric the last remaining site was taken. The host, a very pleasant man who clearly liked a chat and had a sense of humour was very welcoming and the price was cheaper than the other site. It was more of a gravel parking lot, but very clean with level sites and as it was after dark and somewhere secure for us to sleep the night, it suited us just fine. 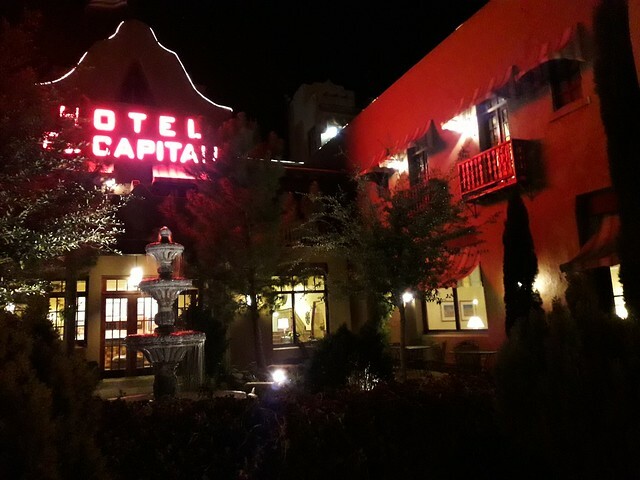 He recommended the 'El Capitan' Hotel for food which was handily located just around the corner. It was a lovely historic building with a Spanish/Mexican influence to it with lovely old furnishings and floor tiles. The food was fantastic but unfortunately the service was chaotic, although they seemed to be trying their best and friendly they seemed inexperienced and left with no guidance from management. I could write a chapter on the efforts to get a drink and the correct meal, but I won't ! Haha. Despite the waiting and frustration, it was a pleasant and (in the end) relaxing evening. We returned to the RV for a nightcap and was ready for a good nights sleep. Today's Mileage:264. Total :1726 miles. Last edited by Southwest Dave; 04-16-2019 at 11:11 AM.